A baseball trip like no other we have ever taken! That pretty much sums up this week in a nutshell! Seven days, six new ballparks, and lots and lots of miles in between! 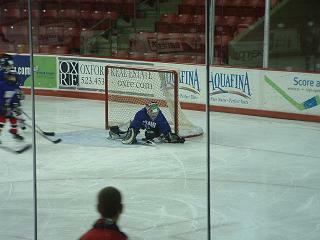 We signed Michael up for a hockey camp at Miami of Ohio University in beautiful Oxford, Ohio. Not wanting to leave him 10 hours from home by himself, Jill and I decided to stay 'in the area' for the week that he was in camp. That afforded us the opportunity to visit a part of the country we had never been before, and check off quite a few more stadiums from the 'master list'. Around mid-morning on Saturday we started our trek, out across Route 17 and 86 in New York (yet another LONELY stretch of road! ), making it as far as Erie (ERIE!! ), Pennsylvania before stopping for lunch. We stopped at the Quaker Steak and Lube, one we had been to a couple of times before, for a bite to eat before continuing on. 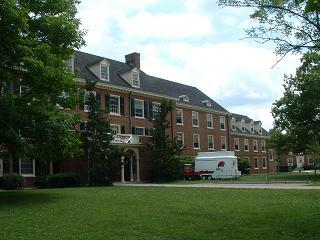 We arrived in the Akron/Richfield, Ohio area around 4:00 or so in the afternoon, and went to the hotel to check in. We were staying at the Hampton Inn on Brecksville Road (room 306) on our way out - a free night by using points! Bonus! The room was a usual Hampton Inn, a little 'older', but sufficient for what we needed it for. After settling into the room, we were off to our first game of the week - the Akron Aeros versus our Binghamton Mets at Canal Park in Akron. We had some pretty good seats, first row right behind the B-Mets dugout, for our second 'away' foray to watch our home team this season. As before, the B-Mets dropped this one in typical Binghamton fashion (I really don't think we're a jinx though, really). Overall, the stadium in Akron was a nice one, and would probably rank mid range in comparison with all of the other stadiums we visited throughout the week. Back to the hotel after the game for some much needed sleep for the rest of the drive on Sunday. On Sunday we were up and out mid-morning, furthering our trek to the south and then skirting west just to the north of Columbus and then Dayton. We arrived in Oxford an hour or so before we could check Mike into the camp, so we found a Buffalo Wild Wings (which every good college town should have!) for some lunch. Then it was off to Miami of Ohio. We found it to be a beautiful campus, well cared for, with classic colonial buildings throughout. 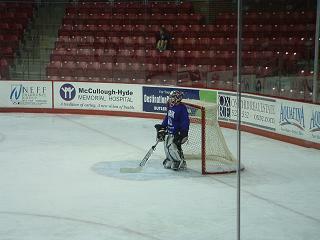 The Goggin Ice Center, only a few years old at this point, was one of the nicest rinks we've been in, and we knew Mike would have a good week skating there. After checking in at the rink, and stowing Mike's equipment (in his own individual locker - neat!) we went over to the dorm. Mike shared a room with another player (but since we were there first, he got to chose his bunk :-) ). After unpacking Mike we went to a parents and players meeting on the quad, and then said good-bye to Mike for the week. About 45 minutes away, just north of Cincinnati, Jill found a TownePlace Suites by Marriott, a good choice since we would be 'living' there for the next week or so. The room came complete with a kitchen and everything! Our next 'check off the list' thing to do was visit the 'original' Hofbrauhaus, which was located in Newport, Kentucky, just across the river from downtown Cincinnati. This was the first Hofbrauhaus in America, and would be our fourth one visited. After this one, only the one in Panama City, Florida remains. As we have noted in all of our other Hofbrauhaus trips, this one was much different than the rest, both in decor and taste. It certainly had an 'older' and 'less cared for' feel about it when compared to the rest, and the service was, well, subpar (again compared to the rest). Right across the street from the Hofbrauhaus was the Purple People Bridge, a quirky 'tourist attraction' that linked Newport with Cincinnati. It was once a railroad bridge, but now existed as only a footbridge. Jill and I ventured across the bridge and found ourselves on a very nice riverfront walkway that led up to the US Bank Arena (home of the Cincinnati Cyclones) and the Great American Ball Park (home of the Cincinnati Reds). After walking down and around the stadiums, we walked back to the car and headed towards the hotel. We made a stop along the way at a Meijer to stock up on some stuff for the room for the rest of the week. Back to the hotel after that for some sleeps. 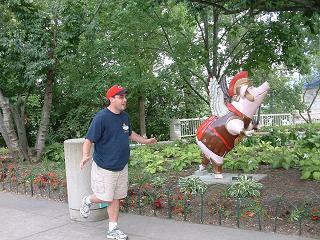 Monday was, well, another day to 'check' something off of our multiple lists, this time the amusement park list. A short drive from our hotel (we're talking about 10 minutes tops here) was Kings Island, that featured no less than 13 different roller coasters as well as many other rides! We rode the Backlot Stunt Coaster (3 times! ), Flight of Fear (once, that was enough), Avatar: The Last Airbender (interesting spinny ride), Fairly Odd Coaster (cute little coaster), Rugrats Runaway Reptar, the Kings Island Railroad, Scooby Doo and the Haunted Castle, the Zephyr, and the Shake, Rattle, and Roll. We had lunch in the Festhaus, and wandered through the shops as well. Overall, it was a very nice (and clean) park. On Monday night, we drove about an hour and a half to two hours up to Columbus for our next baseball game - the Columbus Clippers in their new digs Huntington Park. The team moved into this new stadium just this season, and they have a real gem on their hands there. 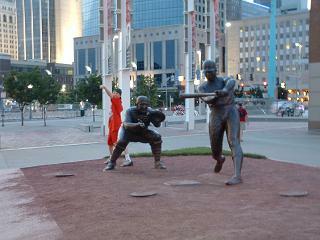 It's located right downtown, adjacent to the arena that the Columbus Blue Jackets play in. We parked in the lot between the two venues, and entered the stadium through the center field gate (which, as we found throughout the week, was a popular entrance for many of the parks). We sat down the right field line, but had a good line of sight as the seats were tipped towards the field for maximum visibility. We had dinner from the BBQ stand in the right field corner, and also a salad from a stand in the same area. The beer choices were plentiful, and they even had Leinenkugel's on tap! Woot!! After the game, we drove back to the Cincy area, stopping at another Meijer on our way back to the hotel to purchase some more comfortable pillows and a couple of other items. Back to the hotel afterwards. Tuesday would take us to another, and new, state. This would be the first time that either Jill or I had been to Indiana, and, well, it ended up being a place we're really not in a hurry to get back to. It's interesting how we can all be 'Americans' and areas of the country can be so different, both in 'culture' and 'attitude'. I guess that's what makes America great, yeah? It was about a two hour drive from the hotel to Indianapolis (I see a 'two hour' theme here), and our first stop was Victory Field, home of the Indianapolis Indians, to snag up a couple of tickets for the game that night, and to visit the souvenir store. After that, we drove a couple of blocks and stopped at Lucas Oil Stadium, the home of the Indianapolis Colts, to peruse the team store there as well. Aside from the baseball game, the other main reason we ended up in Indianapolis was for the Indianapolis Motor Speedway. I was pretty excited to take Jill there so she could 'kiss the bricks' at the start/finish line and tour this grand arena of racing. We had a scheduled 1:15 tour, and with some time to kill (and grumbly stomachs) we stopped at Grindstone Charleys for some lunch. Then it was time for the tour! We boarded the tour bus (they had the A/C cranked - brrrr! ), and were immediately on the speedway! Our first stop was along the wall to see the new technology as far as the wall buffers goes, and then we were on to the start finish line and those historic bricks! We got out, took pics, kissed the bricks! It was pretty awesome to just stand there and look around! From there we went to the press room, the finish circle, and into one of the suites before heading back to the museum. Jill and I walked around the museum for a bit, and then headed back to downtown Indianapolis. We parked near a downtown mall and walked through there for a while before heading back to the baseball stadium. We got to the stadium a little early, but found that (and this was supported at every park the rest of the week) the crowds in the Midwest were early arriving crowds. 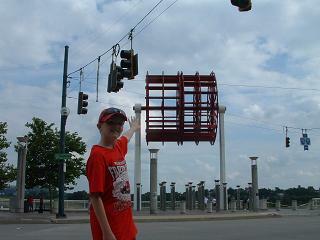 We parked the car at the White River State Park and walked the block to the stadium. We entered through the third base gate, but many of the fans were coming in, once again, through the center field gate. This was the first minor league stadium we had been in where you could walk completely around the stadium, a feature I quickly learned to like. The entire outfield had a grassy berm where folks could lay out a blanket and watch the game, a very nice touch. After the game we made the two hour drive back to the hotel in Cincy. Ah, Wednesday. I purposely didn't 'schedule' anything for Wednesday, and when we hit the middle of the week, I was REALLY glad that I didn't! Needing to recharge our batteries a bit, we slept in on Wednesday, and it was almost 1:00 by the time we headed out. Downside to that was apparently the maid stopped working at noon or something like that because our room wasn't made up when we got back later that night! Our first local stop was at Camp Washington, THE place in Cincinnati by all accounts to get the quintessential cuisine in that area - Cincinnati chili! This place didn't disappoint either! It was the first time I had ever had the chili, which tasted a lot like my garbage plate sauce. I had the five way which was spaghetti, beans, onions, sauce, and cheese, and it was delicious! Jill had an equally as good Greek salad. A great meal, and a definite 'go back to' if we were ever in the area again. After breakfast/lunch, we headed north to Jungle Jim's International Market, which was just about the largest, and most definitely the quirkiest grocery store we had ever been to! It took us well over an hour to peruse through all of the different areas of the store, and look at the HUGE selection of stuff! We were only going to 'look around', and we ended up walking out with two bags worth of stuff and a six pack of Hefewiezen beer! Our Wednesday baseball game was in Dayton, and to tell you the truth when I planned this trip a Dragons game was kind of an 'afterthought'. I took the attitude of 'if we get there, we get there'. Well, am I glad we got there! Fifth Third Field was probably the nicest park we visited all week long, and it's amazing that this is a single A level park. I'm sure it has everything to do with the fact that there aren't any AA clubs in this part of the country, and there are already quite a few AAA parks around here. That being said, this was a class act for single A ball. Another stadium that you could walk all the way around (which, again, has quickly become a plus in my book! ), well cared for, friendly staff, large souvenir store with tons of stuff! A great experience all the way around! We enjoyed the game, and made the 45 minute trek back to the hotel afterwards. Thursday would prove to be our last 'daytrip', and day five of six in a new ballpark. Today, we drove to Louisville, Kentucky, home of the Louisville Slugger Company, the Louisville Bats, and Churchill Downs. First order of business when we got to Louisville was to go to Louisville Slugger Field and get tickets for the game that night. 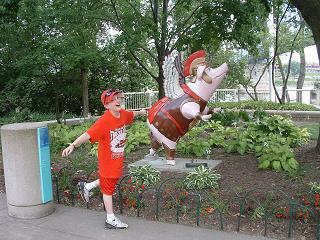 Afterwards, it was on to the Louisville Slugger Factory. The factory was actually a pretty neat tour to take. It took us right through the active factory floor, where they were making both the commercial and minor league bats, as well as the bats for the major league's. On this day, they were making bats for Gabe Gross of the Tampa Bay Rays. We saw the process from start to finish, and were able to walk away from the tour with a couple of 'nubs' and a couple of mini-bats. We tried walking around the museum portion of the factory, but a large school group/summer camp had invaded the place so we decided to move on. We stopped in the gift shop quick to pick up the bat Jill had made for Michael, and then headed off towards 'downtown' Louisville. We found a place called 'The Pub' on 4th Street, which was a 'traditional' British Pub. I had some bangers and mash, and Jill had a salad with chicken on it. After lunch, we walked back to the car and made our way to Churchill Downs, home of the Kentucky Derby! There wasn't any racing going on during the day (they had moved the race to the night - the first one ever at that venue), so we wandered around a bit before leaving. We found a mall nearby to walk through for a while before heading back downtown for the ballgame. Louisville Slugger Field was reminiscent of Victory Field in Indianapolis with its walk around and 'upper' deck. There was a large party deck in right center field, and this is where we found most of the people when we first got there; there was even a musician playing, a regular happy hour going on! We watched the entire first game and then part of the second game before heading to Lynn's Paradise Cafe on Barret Ave in Louisville. This place had been featured on 'Throwdown with Bobby Flay', as well as appearing in our '1000 Places To See Before You Die' book. We sat at a table that actually had a working toy train inside of it! Pretty cool! We shared fried green tomatoes for an appetizer, and I had a hot brown which was delicious along with a couple of Kentucky Ale's to drink, and Jill had spicy seared salmon and a couple of Pegasus Pimms to drink. A very good meal for sure!! Two hours back to Cincinnati afterwards for our last night there. On Friday morning, it was time to pack up and go to get Mike from his camp. We were out of the hotel around 9:30 or so, and back in the Oxford area around lunchtime. We walked the campus a bit and found that the bookstore was closed, so we drove 'downtown' and found a Miami of Ohio store there. After buying some university wear, we headed back to the Goggin Ice Center for Mike's final game. His team (purple) lost out to the orange team 3-2. We packed Mike up from both the rink and his dorm room, he said his goodbye's to the great staff and friends there, and we trekked back to Cincy. For parking, we actually scoped out an area with a few parking options in Covington, Kentucky, which was across the river from downtown Cincy, and adjacent to Newport where we had been the previous Sunday. We actually walked from the parking lot to the Hofbrauhaus Newport, which is where Mike wanted to go since he had never been there before. After dinner we walked across the Purple People Bridge, and on to the Great American Ball Park for the Reds game against the St. Louis Cardinals. We had the best seats we've ever gotten off of ticketmaster, aisle seats, third base side, ten rows or so back! The place was really red too - from seats to facades to fans, red everywhere! The stadium seemed very cramped at points though, probably because it was a sellout (only their 5th this season) and the fact that the concourses seemed a bit smaller than those in other parks of similar size that we've been in. 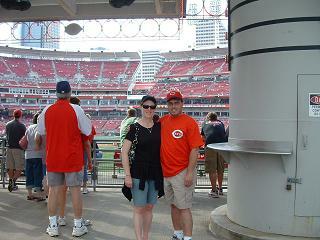 We stayed at the game until around the 8th inning and then, in the interest of 'beating the traffic', we headed out. We drove back as far as the Hampton Inn in Richfield (the same we had stayed at a week ago), which ended up being around 3 hours from Cincinnati. On Saturday morning (July 4th), we woke up and started the long, last leg of our journey. Why is it the part where you come home always seems the longest? We drove as far as Erie (ERIE!!) and stopped at the Smokey Bones there for lunch. On the road after that, with one other stop in Bath at the ice cream place there for a snack! We arrived back home in Binghamton around 7:00 or so. The Aeros struck for five runs in the bottom of the first and never looked back, rolling to an 8-3 victory over Binghamton before 4,187 fans at Canal Park Saturday evening. Akron won for the 17th time in 21 games and improved to 50-23 overall, while the B-Mets continued their slide in the opposite direction, losing for the 20th time in 26 games this month to sit at 27-46 overall. Akron jumped out of the gates early and often against Binghamton starter Brad Holt, loading the bases on a pair of walks and a single from Asdrubal Cabrera with only one out in the bottom of the first. Beau Mills then laced a single up the middle to score a pair before Matt McBride drove a three-run homer down the left field line to make it 5-0 just six batters into the game. It was McBride�s third homer of the year as an Aero and gave him 60 RBI for the season between Akron and Class A Kinston, tied for seventh in minor league baseball. Another home run paced Akron in the fourth inning, as John Drennen and Jared Goedert starting things off with a single and a walk, respectively. Mets reliever Stephen Clyne then hit Cabrera with a pitch to load the bases, but was on the verge of getting out of the inning when Cristo Arnal lined into a double play. Nick Weglarz made sure the Aeros would capitalize however, booming a three-run homer over the bleachers in right to stretch the margin to 8-0. The blast extended his hitting streak to six games and his on-base streak to 21 straight contests. The B-Mets avoided the shutout on an RBI double from Jose Coronado and a run-scoring groundout from Emmanuel Garcia in the fifth, and cut the deficit to 8-3 in the sixth when Lucas Duda flared an RBI single to right-center for the final margin. Josh Tomlin (8-4) earned the win and notched his team-leading seventh quality start of the season while becoming just the second player in both the Eastern League and the Indians minor league system with eight wins. He allowed just three runs, six hits and a walk while striking out seven in a season-high seven innings of work. Holt (0-1) took the loss for the B-Mets as he recorded only one out in his first outing since spraining his ankle June 1st, and he permitted five runs, three hits and two walks in the shortest outing of his professional career. Erik Stiller worked two scoreless innings of relief, marking his 11th scoreless outing in his past 12 relief appearances (0.50 ERA in his last 18.0 innings). Mills, McBride and Weglarz drove in all the runs for the Aeros, and the outfield trio of McBride, Drennen, and Jerad Head went a combined 7-12. Akron and Binghamton partake in game three of this four-game series Sunday afternoon at 1:35 p.m. for Orbit�s Birthday Bash at Canal Park sponsored by ACME Bakeries. Local mascots such as Moondog from the Cleveland Cavaliers and Sully from the Lake Erie Monsters will be on hand, and it will also be Strikeout ALS Day sponsored by the ALS Society. Left-hander Aaron Laffey (0-0, 0.00 ERA) will make his second rehab start with the Aeros as he makes his way back to Cleveland after suffering a strained right oblique May 22nd at Cincinnati, and is expected to face Binghamton�s Jenrry Mejia (0-3, 3.74 ERA). The game broadcast begins at 1:20 p.m. on SportsRadio 1350 AM and online at www.akronaeros.com. For more information, please call the Aeros at (330) 253-5151. The Clippers lost to the Durham Bulls 4-3 Monday in the continuation of a four-game series at Huntington Park. The third inning started the scoring when Michael Brantley knocked the first hit of the game to center field. After a walk to Trevor Crowe, Jordan Brown reached first on an error to load the bases. Matt LaPorta was hit by a pitch driving home a run. The Clippers lead did not last; Reid Brignac doubled and came home on Matt Joyce's homer to put Durham up 2-1. The Clippers regained the upper hand 3-2 in the sixth scoring a pair of runs. Brown and LaPorta opened with back-to-back singles and Tony Graffanino reached on a fielder's choice, forcing-out LaPorta. Andy Marte singled scoring Brown and with two outs Wyatt Toregas scored Graffanino on a hit. The Clippers once again failed to keep the lead after Jon Weber singled, reached second on a wild pitch and scored on Ray Olmedo's single. The Clippers replaced starter Kenny Ray with Jensen Lewis, who gave up a run scoring double to Reid Brignac and putting the Bulls ahead to stay 4-3. The Clippers try to avoid the sweep Tuesday when Kirk Saarloos takes the mound against Carlos Hernandez. The first pitch is scheduled for 7:05pm. INDIANAPOLIS -- The Toledo Mud Hens scored at least one run in each of the first five innings led by second baseman Scott Sizemore, who went 3-for-4 and drove in four runs, as they went on to defeat the Indianapolis Indians 9-7 on Tuesday evening at Victory Field. With the loss the Indians drop to 37-40 overall and 19-22 at home, while the win improves the Mud Hens to 34-44 on the season and 18-25 on the road. The victory for Toledo prevents the series sweep by Indianapolis and improves Toledo's record to 4-6 against the Tribe this season. Sizemore wasted no time in giving the Mud Hens an early lead, when he blasted a solo home run to deep left field with one out in the top of the first. The long ball was just the second of the season for Sizemore and his first of a season-high four RBI. Toledo then capitalized on multiple Tribe mistakes over the next four innings as they plated a run on a throwing error in the second, a run on a balk in the third, a run on a fielding error in the fourth and a another run on a second throwing error in the fifth. In between the error in the fourth and the fifth, Sizemore blew the game open with a two-run single following the error that plated LF Wilkin Ramirez and C Max St. Pierre. However, Indianapolis would not just roll over as they mounted a comeback with two runs in the fourth and five in the fifth to draw the score even at seven runs apiece. RF Larry Broadway started the scoring for the Tribe when roped a two-out base hit in the fourth that plated CF Luis Cruz and C Erik Kratz, who led off the frame with back-to-back base hits of their own. Indianapolis then exploded for five runs in the fifth led by 2B Shelby Ford, who led off the frame with his second triple of the season and then trotted home when LF Pedro Lopez ripped a double to right. Later in the inning, Cruz and Kratz collected back-to-back singles for the second time with Kratz's base hit bringing home Lopez for the innings second run. Following Kratz's base knock, 1B Brian Myrow lifted a single of his own that loaded the bases and set the stage for another two-run base hit by Broadway. Toledo also would commit a costly fielding error on Broadway's base knock that allowed Myrow to trot home and tie the score at 7-7. After surrendering a five run lead, Toledo's offense would come through in the clutch with two runs in the eighth inning that propelled them to the victory and prevented Indianapolis from taking the series sweep. St. Pierre started the rally with a one out infield single and scored what turned out to be the game-winning run when DH Will Rhymes lined a double to center. Later in the frame Toledo added an insurance run when Sizemore capped his season best performance with a single that scored Rhymes for his fourth RBI on the evening. Sizemore (3-for-4, 1 R, 4 RBI) along with St. Pierre (2-for-4, 2 R, 1 RBI), SS Brent Dlugach (2-for-4, 1 R) and 3B Mike Hessman (2-for-4, 1 R) all turned in multi-hit performances for the Mud Hens, who pounded out double digit hits for the second consecutive contest. Indianapolis also managed multiple hits in defeat as Broadway (2-for-4, 4 RBI), Kratz (2-for-5, 2 R, 1 RBI), Cruz (2-for-5, 2 R) and Myrow (2-for-4, 1 R) all collected multiple base knocks. Neither starter figured in the decision as Indianapolis starter Brad Lincoln (3.2 IP, 6 H, 6 R, 3 ER, 2 BB, 1 SO) struggled in his first career start at Victory Field, allowing six runs (three earned) on six hits in just 3.2 innings and Toledo starter Chris Lambert (5.0 IP, 10 H, 7 R, 6 ER, 1 BB, 6 SO) allowed seven runs (six earned ) on 10 hits in five innings of work. The game was instead decided in the bullpen, where Toledo reliever Jay Sborz (2.0 IP, 3 SO) picked up his first win in a Mud Hens uniform and RHP Casey Fien (1.0 IP, 2 BB, 1 SO) notched his first save, while Indians' reliever Mike Koplove (1.2 IP, 4 H, 2 R, 2 ER, 1 BB, 1 SO) allowed his first runs as a member of the Indians and took the loss to drop to 1-4 on the year. Following an off day the Indians will play a doubleheader on Thursday with both contests slated for seven innings with the first game beginning at 5:30 p.m. In game one of the doubleheader RHP Eric Hacker is scheduled to start for Indianapolis, while RHP Ramon Ramirez is expected to get the nod for the Bats. Both contests will be carried by WXLW-950 AM and www.IndyIndians.com with Howard Kellman and Scott McCauley. The pre-game show begins at 5:10 p.m.
Fort Wayne: Allan Dykstra (5th, 0 on base in second inning). Dayton: Cody Puckett (12th, 1 on base in sixth inning). Dayton, Ohio-Yefri Carvajal drilled a tie-breaking two-run single in the top of the ninth inning to lift the Fort Wayne TinCaps to an 8-6 victory over the Dayton Dragons on Wednesday. The Fort Wayne win spoiled a Dragons comeback bid. Dayton trailed 5-1 at one point before rallying to tie the game at 6-6 in the eighth inning. Fort Wayne jumped out to a 3-0 lead in the second inning. Allan Dykstra led off the inning with a long home run to left-center field, his fifth of the season. Cole Figueroa followed with a double and one out later, Dragons starting pitcher Oscar Castro issued three consecutive walks to force in a run. Drew Cumberland then added a sacrifice fly to give Fort Wayne a three-run lead. The Dragons scored an unearned run in the third but Fort Wayne answered with single runs in the fourth and fifth innings to take a 5-1 lead. In the Dayton sixth, Carlos Mendez singled to right to start the inning and Cody Puckett followed with a two-run home run to left, his 12th homer of the year, to make it 5-3. Byron Wiley walked and stole second, but was thrown out trying to score from second on a single to right by Kevin Coddington. After a walk to Kyle Day, Miguel Rojas doubled to right to score Coddington and pull the Dragons to within one at 5-4. Andrew Means walked to load the bases, but Dave Sappelt struck out to end the threat. Fort Wayne scored one run in the top of the eighth to take a 6-4 lead, but the Dragons answered with two runs in the bottom of the inning to tie the game. Dayton got back-to-back two-out walks with the bases loaded by Carlos Mendez and Cody Puckett to force in the tying runs. Dayton reliever Junior Martinez (2-1) issued consecutive one-out walks in the ninth and was replaced by Scott Gaffney. After an infield hit loaded the bases, Carvajal lined a single to center to give Fort Wayne an 8-6 lead. TinCaps reliever Brad Brach allowed only a one-out single to Kevin Coddington in the bottom of the ninth to earn his 18th save. Dayton finished with nine hits. Rojas collected three hits to lead the way. Coddington had two hits and extended his hitting streak to nine straight games while raising his batting average to .306. The Dragons (3-3, 31-45) host the TinCaps (5-1, 50-26) in the third game of the series on Thursday at 7:00 p.m. at Fifth Third Field. Lance Janke (4-3, 3.44) will start for the Dragons against Stiven Osuna (3-6, 5.27). LOUISVILLE, Ky. -- Louisville Bats' hurlers allowed just three runs in two games as they took home two one-run victories, 2-1 and 3-2 to sweep away the Indianapolis Indians in Thursday's doubleheader at Louisville Slugger Field. With the doubleheader sweep the Bats improve to 44-36 on the season and 24-16 at home, while the Indians fall to 37-42 overall and 18-20 on the road. The doubleheader sweep for Louisville increases their season series edge to 5-2 and increases their lead to 6.5 games over Indianapolis in the International League west division race. In game one, Louisville starter Ramon Ramirez (6.1 IP, 6 H, 1 R, 1 ER, 0 BB, 4 SO) and reliever Pedro Viola (0.2 IP, 1 SO) combined to hold the Tribe to just one run on six hits as Ramirez picked up the win to improve to 3-5 and Viola finished off the seventh for his fifth save. The Bats jumped out to an early lead with single runs in the first and second innings and Ramirez and Viola made it stand up allowing just a seventh inning solo home run to Tribe LF Larry Broadway. The longball for Broadway was his fifth of the season and his first since being activated from the disabled list on June 30. In just his fifth game at the Triple-A level RF Chris Heisey sparked the Bat's first inning scoring attack, when he drew a two-out walk and came plateward on former Indianapolis Indians' INF Kevin Barker's run scoring double. Louisville then quickly extended their lead to 2-0 in the second, when LF Danny Dorn led off the frame with a double and trotted home on a single by 2B Chris Valaika. The two runs were all the Bats would need as they held off the Tribe scoring attack to take game one by the score of 2-1. Both teams managed only six hits in the pitcher's duel as only CF Drew Stubbs (2-for-3) managed multiple hits for Louisville and just CF Luis Cruz (3-for-3) turned in a multi-hit performance for the Indians. Indians' starter Eric Hacker (4.1 IP, 6 H, 2 R, 2 ER, 2 BB, 3 SO) took the loss in game one to drop to 2-2 on the season even though he allowed just two early runs, while Tribe reliever Donnie Veal (1.2 IP, 2 SO) held the Bats hitless in his 1.2 innings out of the bullpen. Little changed in game two as Louisville hurlers again held down the Indians' offense, allowing just two runs on six hits as the Bats' collected their second straight one-run victory by the score of 3-2. Louisville starter Adam Pettyjohn (4.0 IP, 4 H, 2 R, 2 ER, 1 BB, 3 SO) allowed just two runs on four hits, but failed to go the needed five innings for the victory. Instead, relievers Jeff Kennard (2.0 IP, 1 H, 2 BB, 3 SO) and Robert Manuel (1.0 IP, 1 H) combined for three shutout innings with Kennard collecting the victory to improve to 2-1 and Manuel notching his seventh save with a scoreless seventh. Louisville, led by SS Adam Rosales and Valaika, plated all the runs they would need with single tallies in the second, third and fourth innings. After having his 13-game hitting streak broken in game one, Rosales sparked the Bats' scoring attack in both the second and fourth innings. Rosales led off the second with a double and came around to score on a sacrifice fly by Valaika, before leading off the fourth with a single being plated a second time when Valaika ripped a double to right-center. In between the Rosales and Valaika connection, IL All-Star Stubbs sparked a third inning score, when roped a single to center, stole second and came around to score on a base hit by 3B Edwin Encarnacion. Both Encarnacion (2-for-3) and Rosales (2-for-3, 2 R) collected multiple hits for the Bats, while only 1B Miguel Perez (2-for-3, 1 R) managed a multi-hit effort for the Tribe. Broadway, however, remained on an offensive power surge for the Indians as he blasted his second solo home run of the double header, connecting off Pettyjohn for a lead-off shot to right to begin the fourth. Perez led the other Indians' scoring rally when he lifted a one-out single in the second and eventually trotted home on a double by 2B Brian Bixler. Indianapolis starter Jeremy Powell (4.2 IP, 7 H, 3 R, 3 ER, 0 BB, 3 SO), pitched well but allowed all three Bats' runs to take the loss and drop to 4-4 on the season, while reliever Juan Mateo (1.1 IP, 1 H, 1 BB) continued the Indians' bullpen dominance with 1.1 scoreless innings of work in the defeat. Indianapolis wraps up their short three game series in Louisville on Friday at 7:05 p.m. LHP Tom Gorzelanny is scheduled to start for the Indians, while LHP Ben Jukich is expected to get the nod for the Bats. The contest will be carried by WXLW-950 AM and www.IndyIndians.com with Howard Kellman and Scott McCauley. The pre-game show begins at 6:45 p.m.
CINCINNATI -- Homer Bailey exited the seventh inning to a standing ovation from a sold-out crowd at Great American Ball Park with with a three-run lead after holding the Cardinals scoreless. He probably should have just headed to the locker room after he left the game, for what he was about to witness over the next two innings had to be difficult to watch. After Bailey had arguably the best start of his career on Friday, the bullpen couldn't hold on in a 7-4 defeat. "For any starter, if they come out of the game it's very tough," Bailey said. "You always want to be back out there. There's no one I would ever want out there besides the two guys who followed me. It's just sometimes how baseball works." Once Bailey left, the game didn't work in the Reds' favor at all. Bailey left the game with two runners on and one out. Manager Dusty Baker turned to reliever Arthur Rhodes, who walked Jarrett Hoffpauir to load the bases. Baker then brought in reliever David Weathers to face Albert Pujols, who was 9-for-18 against Weathers entering the game. "There's nobody out there that has numbers against him," Baker said of matching Weathers against Pujols. "He's something else." And Pujols showed exactly why he is something else. He got the best of Weathers again, crushing a grand slam to left-center field to give the Cardinals a 4-3 lead. "You make a mistake against a guy like that, you pay the price," Weathers said. The Reds certainly paid a steep price. The lead they had worked seven innings to establish was gone in one pitch, as was Bailey's impressive outing. "Bailey threw an unbelievable game," Pujols said. "We're glad [he came out] in the eighth inning." Yet even with Bailey gone, the Reds showed plenty of fight in the bottom of the eighth inning. Joey Votto singled to start off the frame, and Brandon Phillips followed with a single. Jay Bruce sacrificed both runners over with a bunt, and Ramon Hernandez tied the game at 4 with a sacrifice fly. But the Reds' bullpen couldn't keep the game tied. Reliever Nick Masset started the ninth and got Yadier Molina to ground out. But the ball deflected off Masset and he exited the game. Daniel Ray Herrera relieved him and got Joe Thurston to pop out for the second out. The third out would come much harder, however. Herrera allowed a single to Colby Rasmus and another hit to Brendan Ryan. Skip Schumaker then reached on an error by shortstop Paul Janish to load the bases. And in his Major League debut, Hoffpauir singled to left field to give the Cardinals a 6-4 lead. Baker pulled Herrera for reliever Carlos Fisher, who gave up a double to Pujols for another Cardinals run. But in the ninth, the Reds got another rally brewing. Edwin Encarnacion pinch-hit in his first appearance since returning from the disabled list, hitting a double with one out, and Cardinals closer Ryan Franklin walked Willy Taveras and Votto to load the bases. But Phillips struck out to end the threat. The loss moves the Reds another game back from the Cardinals, who lead them by three games, and shifts them back to .500. But they aren't about to panic. "I think it's crazy to sit here and call it devastating," Weathers said. "It's July the third. I think you've got to keep that in perspective." Before the eighth, Bailey had pitched a near-flawless game through seven innings. He had allowed two hits and one walk while striking out five batters. At one point, he retired 12 batters in a row. "That's why the game is the greatest," Cardinals manager Tony La Russa said. "Bailey's pitching a great game, and we can't get anything going. Sometimes you get something started." And when the Cardinals finished what they started, Bailey could only watch. Nightly rate at The Hampton Inn (on the return trip) was $103.55 per night, for a total of $117.79. Our seats for the Aeros game were Section 107, Row A, Seats 12-13-14.